Dery Bennett joined the Littoral Society staff in 1968 as conservation director and was its executive director until 2002. A graduate of Amherst and a Navy underwater demolition driver, he worked as a newspaper reporter, writer for Harvard University and assistant professor of English before becoming a coastal activist and leader. He chaired and sat on the boards of numerous marine groups and is the author and editor of half a dozen books on fishing and the shore. 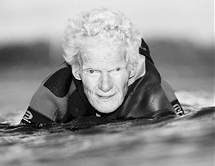 Mr. Bennett passed away in 2009 leaving a legacy of effective and lasting marine conservation work.